Order your Power-Fit Wooden Spoon Mouthguard today and we’ll donate £10 to the Wooden Spoon, the children’s charity for rugby funding life-changing projects across the UK and Ireland. What is the OPRO Power-Fit? The Power-Fit is a unique combination of a hand-made mouthguard with the patented gel fins of our ground-breaking Self-Fit mouthguards and the patented Power-Cage. The patented Power-Cage is what makes the Power-Fit mouthguard the best fitting and most comfortable self-fit mouth guard available today. How does the Power-Cage work? Unlike other traditional boil & bite mouthguards, the Power-Fit comes with our Power-Cage, and this is an integral part of the Power-Fit. This is a 2-piece system that helps mould the gum shield to the contours of your teeth and gums. Traditional home fitted mouthguards rely on the pressure of you using your fingers to press over your teeth to shape the guard, but the Power-Cage does this for you alongside its contouring abilities. Using the Power-Cage applies ever pressure to your mouthguard during moulding giving a tight and comfortable fit around your teeth and gums for amazing retention. How do I fit the Power-Fit? Before you begin, ensure you have the following to hand: a kettle, a non-metallic bowl (that’s deep enough to fully submerge the mouthguard), spoon, and a timer. Fitting the Power-Fit mouthguard is very simple to do. Simply follow the instructions below. Place your Power-Fit mouthguard in the black tray. Pour freshly boiled water into a bowl and then drop the mouthguard in the black tray into the water. Ensure it is fully submerged. Wait for 25 seconds. Remove the mouthguard and tray using a spoon and gently shake to remove any excess water. Take no longer than 5 seconds for this step. Place the mouthguard and black tray into the white tray. Insert the tray into your mouth and bit down for 20 seconds. It’s important to note that the harder you’re able to bite down will determine the quality of the impression. After biting down for 20 seconds, relax your jaw for an additional 30 seconds. This is to allow the mouthguard to cool and settle. Remove the tray and mouthguard and run it under a cold tap, or submerge it in a bowl of cold water for 30 seconds. For full instructions, please refer to the instruction in your pack. Who are the Wooden Spoon? Wooden Spoon is the children’s charity of rugby, funding life-changing projects across the UK and Ireland. Since their founding in 1983, they have distributed in excess of £24 million to more than 700 projects, helping over 1 million children and young people with disabilities and facing disadvantage. When you buy the Power-Fit Wooden Spoon Mouthguard, you not only protect yourself, but you’re helping children in the UK and Ireland thanks to life changing projects. We at OPROMouthguards.com will donate £10 for every Wooden Spoon mouthguard bought. For more information on who Wooden Spoon are and the good work they are doing, . What are the key features of the Power-Fit Mouthguard? Unrivalled Fit: Never before has a Self-Fit mouthguard provided such great retention and fit. This is all down to the patented Power-Cage. Easy to Mould: With our video as a guide, the easy to use Power-Cage makes moulding your mouthguard simple and quick. Even Compression: The Power-Cage provides even compression over the whole Power-Fit mouthguard during the moulding process for a highly retentive fit. Hand Made & Unique: Every Power-Fit is made by hand in OPRO’s state of the art manufacturing facility in Hertfordshire and is available in 4 plain colours or a selection of eye-popping designs. Peace of Mind: The Power-Fit from OPRO is legally CE certified and comes with a comprehensive dental warranty. Sounds good, how do I buy mine? 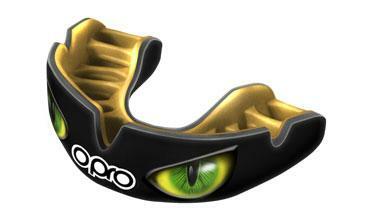 Order your OPRO Power-Fit mouthguard online today from OPROMouthguards.com. The ordering process is quick and easy, plus if you order before 3pm on any working day, you could receive your Power-Fit the very next day! So what are you waiting for?